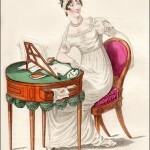 Ackermann’s Repository of Arts, June 1812. 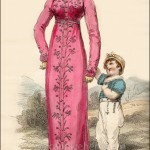 Ackermann’s fashion prints, especially between 1809 and 1812, featured children more often than any of the other ladies’ magazines. Perhaps one of their important target audiences was young mothers. 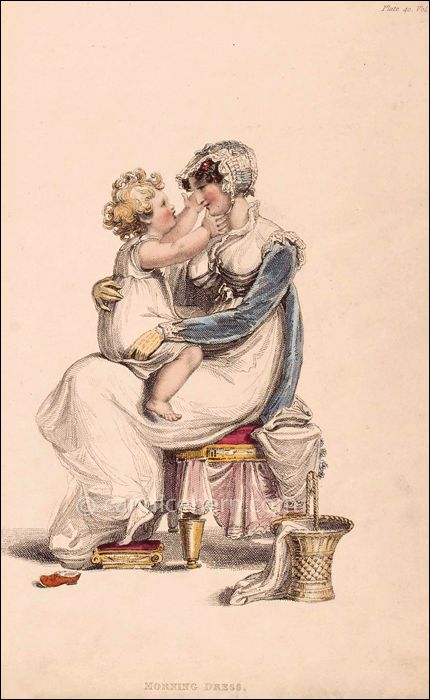 There are such charming details here, including the little red shoe the child has kicked off, the mother’s sewing basket, and the way the child looks about to embrace his mother. Or perhaps tug at her cap!